Get ready to rock because Atlanta’s longest continually-operating restaurant, Pittypat’s Porch, is debuting its new porch during the first-ever Rock-a-Thon this Thursday, June 18, from 5 to 7 p.m. The event will feature a rocking chair musical chairs tournament and patio party benefiting the Atlanta Community Food Bank. Tournament rockers will compete in the signature jumbo rockers from presenting sponsor, the historic Brumby Chair Company, who is also donating one of the prized chairs as the grand raffle prize. Valued at $995, Brumby’s beloved chairs have been fixtures at national landmarks from Yellowstone National Park to Naples, Florida, including the White House! President Jimmy Carter was known to relax in a Brumby rocking chair. 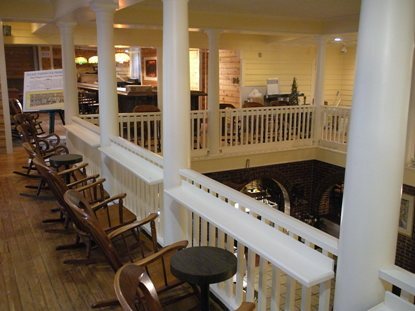 Guests are invited to visit the newly-renovated restaurant and sit awhile on the brand new porch while imbibing in traditionally Southern libations and snacks – just as the restaurant’s namesake, Margaret Mitchell’s Aunt Pittypat from Gone with the Wind, would have. Admission to the Rock-a-Thon includes two drinks tickets, to be redeemed for a mint julep crafted with Chattanooga Whiskey, a glass of wine, sponsored by United Distributors, Inc., or choice of beer each, a selection of fried green tomatoes, shrimp Charleston and black eyed pea cakes crafted by executive chef David Myree. A silent auction, also benefiting the Atlanta Community Food Bank, will include unique and historic items from across the city. Kicks 101.5 will emcee the event and rocking chair tournament with a live remote from Pittypat’s rocking chair lounge. Tune into Kicks 101.5’s “Lunchtime Live with Jenn Hobby” over the next two weeks for a chance to win a $100 Pittypat’s Porch gift card to sweeten the deal! Tickets may be purchased for $29 here. Additional raffle tickets may be purchased on-site for $5 each.